As described in our previous article HD and 4k Delivered by Fibre Broadband, Ultra HD content is developing nicely and BT has now arrived on the scene! BT has made a very promising start with the launch of the UK’s first Ultra High Definition TV channel in the UK, and pricing is very competitive for its Ultra HD TV service. The performance of the Humax YouView+ DTR-T4000 set-top box is superb, with a well-designed remote control and fast menus and Electronic Programme Guide. Ultra HD content looks brilliant, helped by the high bit rate of about 29 Mbps currently being used, which is nearly double that used by Netflix and Amazon for their Ultra HD services. For the latest pricing and service information, please visit BT's website. New! 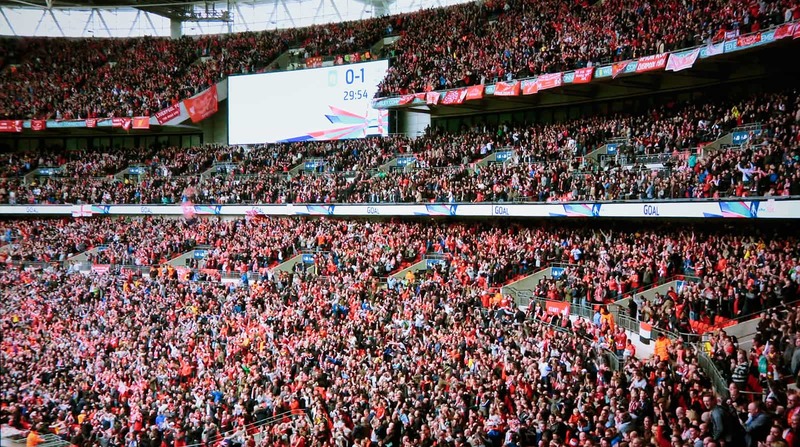 View our review and photographs from BT's first Ultra HD broadcast of the 2015 FA Community Shield match between Arsenal and Chelsea. We were very pleasantly surprised when we heard the initial pricing of BT’s Ultra HD service, although pricing will increase after 12 months. Obviously, with a 12-month minimum term, you have the option to walk away in a year without penalty with the Ultra HD YouView+ box if BT decided to dramatically increase prices. There is currently a monthly subscription of £15, and an installation charge of £44 (for those who are not existing BT TV customers), although there is no charge for the new Humax Ultra HD set-top box. The Humax DTR-T4000 contains a 1 TB hard disk to record programmes, with enough storage space for an estimated 250 hours of HD content (or about 80 hours of Ultra HD content). 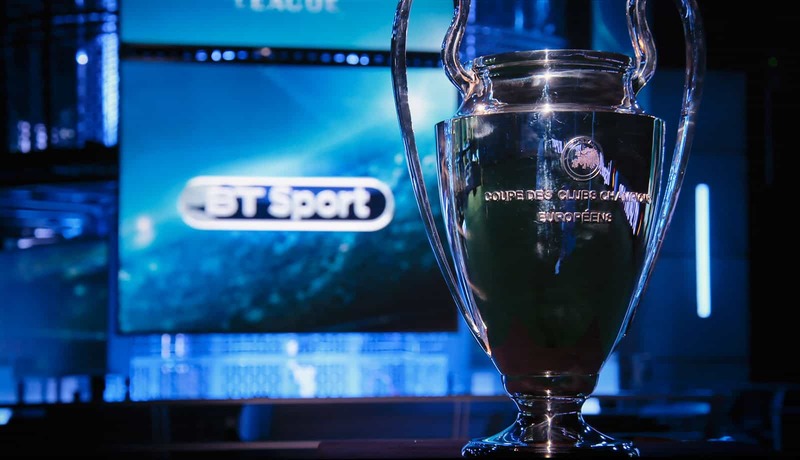 The £15 per month subscription provides access to the new BT Sport Ultra HD channel, four BT Sport HD channels as part of the included BT Sport Pack (with all of the EUFA Champions League provided) and an additional 13 HD channels. 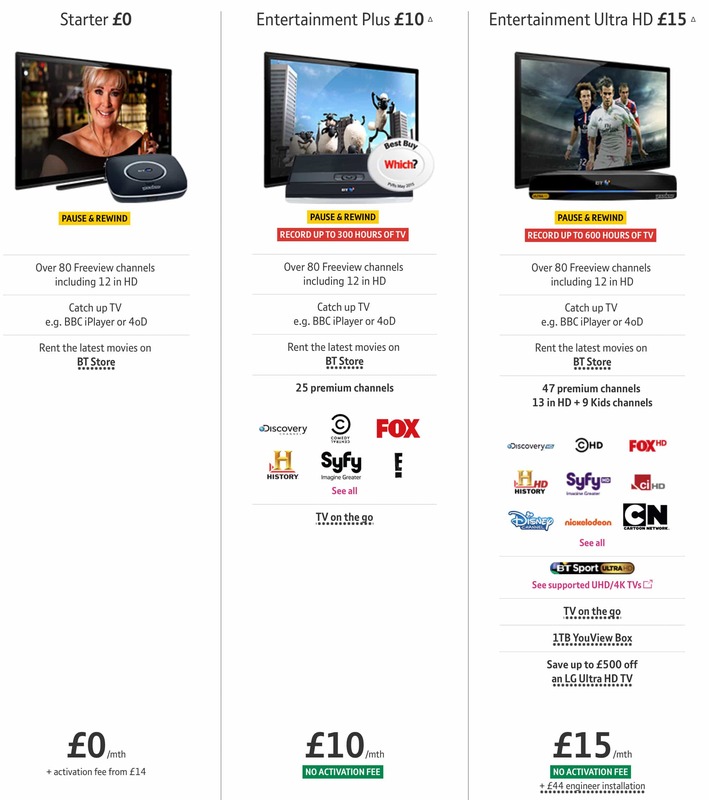 While BT also offers a voucher for “up to £500 off an LG 4k Ultra HD TV”, discounts are only available through BT’s Store, with the highest discounts available on the most expensive TVs. Price comparison against online retailers reveals that it is possible to source LG TVs at competitive prices, and anyway, latest-generation Sony and Samsung Ultra HD LED TVs currently receive more favourable reviews than their LG counterparts. One potential challenge in the ordering process comes from BT implementing a minimum speed hurdle for their Infinity fibre broadband customers. We understand that BT will currently only progress an order if the download speed of the line is estimated to be at least about 45 Mbps. This is to ensure that there is adequate headroom above the data rate required to watch the Ultra HD channel (up to about 30 Mbps) to be able to use the broadband connection for other things (for example, recording another HD channel or browsing the web on other devices). This 45 Mbps minimum speed is well above the 24 Mbps download speed deemed to be ‘superfast broadband’ by the Government. Certainly, in our rural location, a significant proportion of households operating to our local fibre cabinet will not be able to order the service, and it remains to be seen how many people across the country will be affected. There have already been a number of people on online forums reporting their frustration from not being able to order the service. BT needs to get on with improving fibre broadband speeds (for example, through the roll-out of vectoring) to maximize the reach of the service. We hope that BT follows this route rather than simply lowering the bit rates required by Ultra HD content, which may adversely impact picture quality. An area of clear confusion is that 45 Mbps is above the 38 Mbps maximum speed of the BT’s Infinity 1 service, and most journalists have reported that that the higher speed Infinity 2 service (with speeds up to 76 Mbps) is required for the service. Rather confusingly, we understand that customers on Infinity 1 can order the service if their predicted speed (i.e. if they actually had Infinity 2) is above 45 Mbps without needing to upgrade to Infinity 2. There are challenges in installation too. The engineer appeared and said he was instructed to connect the set-top box via Ethernet cable directly to the BT Home Hub 5, and looked rather concerned when he saw that our TV room was on a different floor to our modem router. So, if your TV is a long way away from your router, a significant (and potentially unsightly) job to install an Ethernet cable may be required, particularly as the engineer is not allowed to go up into a loft or put wires under carpets. You cannot connect the set-top box to your router via WiFi. However, in each case, some default settings need to be changed. To set up these routers to work with multicast, you can view our Setting Up the Billion 8800NL and 8800AXL For BT TV (Multicast) and Set Up the ASUS RT-AC87U For BT TV (Multicast) guides. If you are currently not using the BT Home Hub 5, we would recommend connecting it in place while the engineer visits to make the installation as painless as possible, which will give you time to get your own router working. Sadly, we have not been able to get one of the routers we regularly use – a Netgear R7000 using DD-WRT firmware – to work properly with multicast. Our heart goes out to all those who have invested in a shiny new router to find out that it doesn’t support BT’s multicast service. 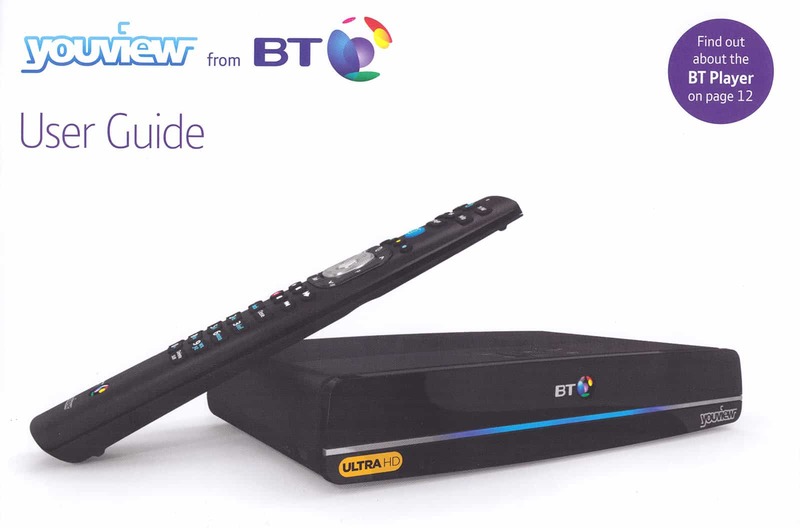 BT provides the Humax DTR-T4000 set-top box with its Ultra HD service. The photo on the user guide (shown below) does not convey how small the box is in real life, for example compared with a Sky+ HD box, and one is left wondering why the Sky box has to be so large. Dimensions of the Humax DTR-T4000 are 23.5cm x 14.9 cm x 3.8 cm. While aesthetically the latest Sky+ HD box looks more modern, the DTR-T4000 takes up significantly less space and is certainly not unattractive. Don't be concerned about the bright 'Ultra HD' logo on the box as this is not as noticeable in the flesh as the box is so small. At the back of the box is a fan, which you can definitely hear, although the noise was not distracting while we were reviewing the service. In use, the box became relatively warm to the touch, so we would advise placing it where there is adequate airflow. The engineer connected the box to our Sony Ultra HD TV via the HDMI cable that came with the DTR-T4000. According to BT’s guide, two of the HDMI slots were compatible with the service. The engineer connected the feed from the TV aerial and Ethernet cable (connected to our broadband router) and it was ready to go. He then ran an update and checked to see everything was working before departing. We have previously used a TalkTalk YouView+ box that was painfully slow, for example, when scrolling through the Electronic Programme Guide. The frustrations of using that box meant that it had no real chance of convincing us to migrate from Sky TV. In sharp contrast with our previous YouView+ experience, the Humax DTR-T4000 is an absolute delight, and the menus and Electronic Programme Guide are very responsive. Below is a video taken of the screen. 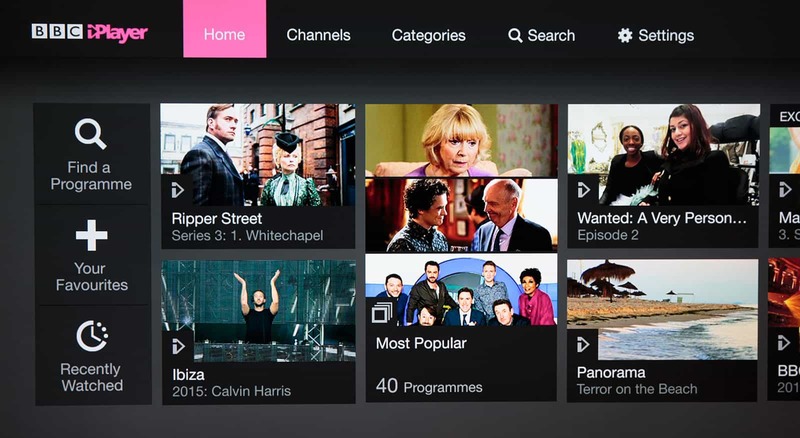 It shows the speed of the Electronic Programme Guide, BT Player, BBC iPlayer and the Discover menu. Making the previous YouView+ box even more of a disaster was a remote control that was obviously designed by someone who never actually used it to watch TV! The remote control with the DTR-T4000 is superb. Being tall and thin, it allows easy access to the buttons that are used most and provides a premium feel to the service. So what is Ultra HD and upscaled HD like? One of the key selling points of BT’s Ultra HD service is obviously Ultra HD content and, currently, it’s very good indeed, helped by the use of a healthy channel bit rate of about 29 Mbps. This is roughly double the bit rate used for the Netflix Ultra HD service – and it shows. Content is broadcast in progressive format with a resolution 3840 x 2160 pixels at frame rate of 50 Hz, to provide smoother motion than is available with conventional HD broadcasts. All the images in this review are actual photographs of our Ultra HD TV. At this early stage, BT is to be congratulated by opting to put quality first and not compromising on picture quality by reducing bit rates. It’s all well and good Ultra HD TV manufacturers displaying their TVs using non-broadcast, slow-motion content in the showroom but, for Ultra HD to succeed, consumers need to see a significant picture quality difference between HD and Ultra HD channels on ‘normal’ broadcast content. On its Ultra HD channel, BT has been continuously running short Ultra HD demonstration clips, which look stunning in places, although (as with most content of this type), the demonstration content is dominated by slow motion sequences. 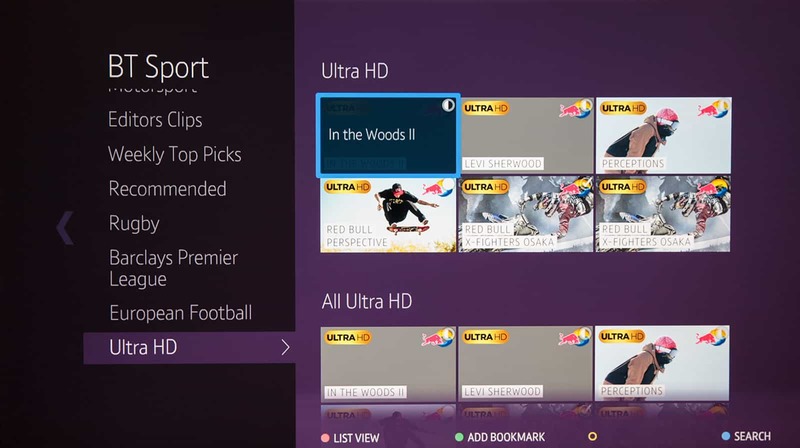 As well as the single BT Sport Ultra HD channel (channel 434), BT currently offers seven free on-demand Ultra HD programmes in its BT Player section (found by going to ‘Library’ and then ‘BT Sports’ and then ‘Ultra HD). Our favourite title was ‘Perceptions’ – a 49-minute programme following a group of snowboard professionals on their journeys across the world. The programme includes some stunning footage of people and Venice. Currently, there are no movies available through the BT Player in Ultra HD format. In additional, all the Freeview HD channels available via terrestrial broadcasting can be watched and recorded, including BBC One HD, BBC Two HD, ITV HD, Channel 4 HD, Channel 4+1 (HD), 4 Seven HD and BBC News HD. Since launch, BT has added Sky Sports 1 HD and Sky Sports 2 HD, for which an additional monthly payment (£27 per month) is required. Moving through the Electronic Programme Guide to look at the available channels delivered via broadband, you are currently presented with a raft of channels, many of which are in Standard Definition. We made the mistake of viewing a Standard Definition channel. 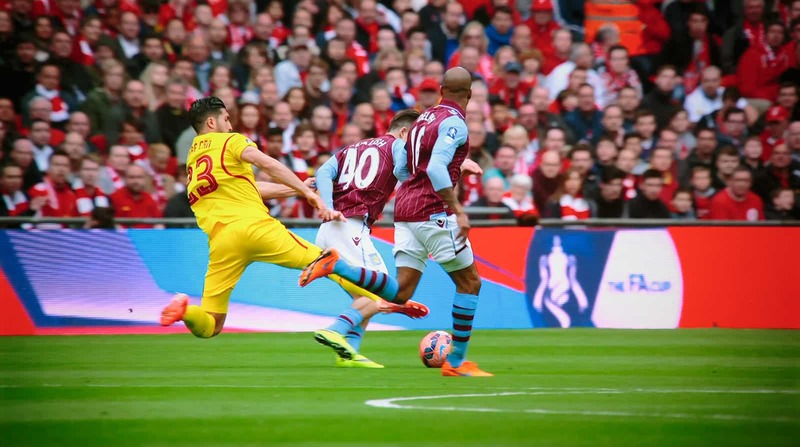 Displayed on our Ultra HD TV, it looked absolutely ghastly! Quite frankly, an Ultra HD TV will always struggle to convert a low-resolution picture into something that occupies so many pixels. 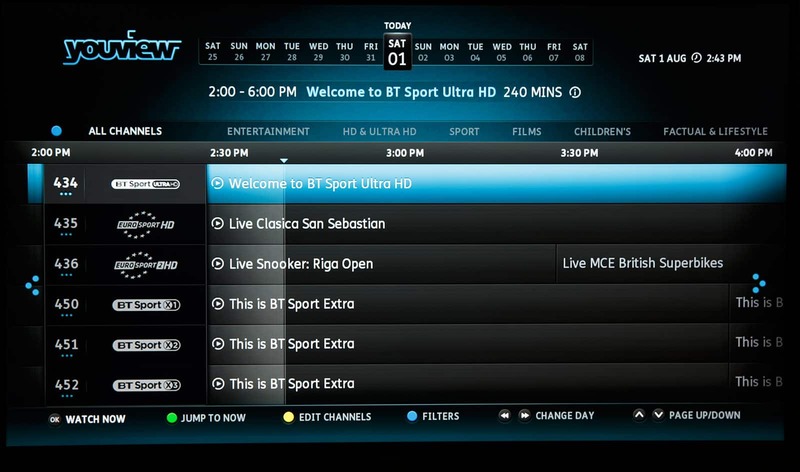 In the Sky+ HD Electronic Programme Guide, users can select a menu of only HD channels, and the pressing the blue button in the YouView Electronic Programme Guide allows only HD and Ultra HD channels to be listed. With so many homes now having HD TVs, it is curious that there are so many SD channels available via multicast. Surely, these are taking valuable resources in the BT network that could be devoted to HD and Ultra HD content. When we tried to order the service, we were asked for the model number of our TV to ensure that it was capable of displaying Ultra HD content, and it is clear that BT is targeting homes with an Ultra HD TV for the service. You can view BT's help page showing TV compatibility and HDMI port settings here for its Ultra HD service. The good news is that the output of the Humax DTR-T4000 can be easily changed to 1080p (or 720p) and works perfectly with existing HD TVs. Essentially, for owners of HD TVs, the Humax DTR-T4000 becomes a top-of-the-range YouView+ box with 1TB of storage, superfast menus and superb picture quality. With an HD TV, you can view the Ultra HD channel (and all online Ultra HD content) in 1080p format, with the benefit of superior motion with 50 frames per second (compared with 25 frames for conventional HD content). Obviously, the picture in 1080p mode lacks some of the ‘wow’ factor achieved with an Ultra HD TV but shows just how good HD can look. We thoroughly enjoyed watching some of the Ultra HD content on our Panasonic VT65 plasma display, with fluid motion and the absence of the digital artefacts that now so often plague HD broadcasts. With its focus on Ultra HD TV owners only, we think that BT may be missing a trick here as its service could have strong appeal to HD TV owners seeking the best possible picture quality. Broadband delivery potentially frees BT from the constraints faced by terrestrial and satellite broadcasters that currently deliver TV content with 25 frames per second and with constrained bit rates. 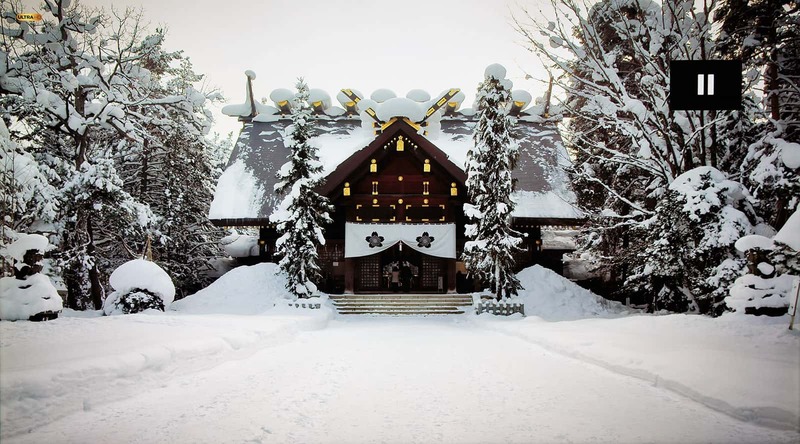 It has the opportunity to differentiate itself from Sky by providing premium picture quality. We watched a number of different multicast channels in different formats and ran an online speed test to gauge the effects these had on the remaining available broadband capacity. Being located close to our street cabinet, we benefit from the maximum 80 Mbps downlink connection speed, giving a maximum throughput of about 74 Mbps. Watching the Ultra HD channel reduced the available throughput of our broadband connection to about 45 Mbps, meaning that the Ultra HD channel was taking up about 29 Mbps. Watching an HD channel gave an available throughput of about 65 Mbps, meaning the HD channel was consuming about 9 Mbps. In comparison, SD channels consumed only about 3 Mbps. In our case, watching (or recording) the Ultra HD channel had a negligible impact on applications (for example, web browsing) that we were running at the same time. We experienced no glitches when watching the Ultra HD channel. Perhaps we are too used to the rapid responsiveness of accessing BBC iPlayer on an iPad or PC, but most set-top boxes, smart TVs and other devices (such as Bluray players) suffer from slow and clunky iPlayer access and operation. In sharp contrast, iPlayer on the DTR-T4000 is an absolute joy to use. With its impressive responsiveness, it’s possible to quickly look through the available programmes and rapidly set your desired programme in motion. Within a few seconds, the stream switches to HD mode, and we’ve not seen any better picture quality from iPlayer. If you’re looking for the best way to watch iPlayer on your TV, then this is probably as good as it gets. The previous video (shown above) shows the real-time speed of iPlayer. One notable missing application on the Humax DTR-T4000 initially was Netflix, which has been incorporated into other YouView set-top boxes since November 2014. This was a shame as it can be very convenient being able to access a range of TV and video services on a single device, particularly one as responsive as the DTR-T4000. Netflix is now available. The addition of Netflix, with its increasing range of Ultra HD content, which includes House Of Cards, Breaking Bad, Better Call Saul, Daredevil, Bloodline, Sense 8, Marco Polo, Grace and Frankie and Video Game High School, significantly enhances the overall Ultra HD content portfolio available on the Humax box. With Sky currently not allowing access to content from third parties such as Netflix on its HD set-top box, being able to access such content with BT’s Ultra HD TV package provides a competitive edge for BT. Conclusion: there’s a lot to like! This is a very exciting and promising service. Initial pricing for BT’s Ultra HD service is excellent and the new Humax box is a corker, being very responsive and capable of delivering superb picture quality. In contrast with an older TalkTalk YouView+ box, this set-top box does not feel like a poor relation to a Sky HD+ box. Currently, the Ultra HD content looks stunning on an Ultra HD TV, helped by the high bit rates being used and BT is to be congratulated for being first in the UK to launch an Ultra HD channel. Perhaps unsurprisingly, there is a lack of Ultra HD content available at the moment, and we hope that BT focuses strongly on building its own Ultra HD content portfolio quickly. An announcement about Ultra HD from Sky is probably not too far away, so BT needs to make the most of its timing advantage. For comparison, you may want to view our recent review of the Sky Q Ultra HD service.